The 2018 Reih Bleeaney Vanannan – Manannan’s Choice of the Year – award from Culture Vannin recognised almost 50 years’ work in teaching, promoting, publishing and developing online resources for the Manx language by one of the cultural community’s most unassuming leaders. 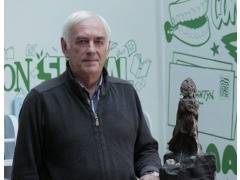 Phil Kelly’s enthusiasm for and dedication to the language he first discovered as a student has provided a vital contribution to the survival and development of Manx. A founder member of Banglane Twoaie, the Northern branch of Yn Cheshaght Ghailckagh, the Manx Language Society, Phil also helped record Manx speakers in the 1970s. As a teacher, too, Phil played a significant role in the success of the Manx language that we see today. He was the second Manx Language Officer for the Department of Education and produced many valuable resources. Outside of that work, Phil produced learning material for beginners, organising and participating in evening classes for all ages at Michael Football Clubroom in the 1990s. He visited and supported many Oieghyn Ghaelgagh (Manx-speaking evenings) and conversational classes around the Island, too. His publications include Fockleyr Gaelg-Baarle, A Guide to Mann’s Placenames and Manx Usage. He was also instrumental in re-printing many short stories in Manx during the 1970s, with the permission of the original authors. Phil was always keen to see how technology could help language learning, and his work on producing material online or in conjunction with apps was pioneering. His online dictionary allowed free and greater access to Manx vocabulary for the wider public, and his Manx Bible site, developed with Ffynlo Craine, makes one of the most important texts in the Manx language accessible and searchable by all: http://bible.learnmanx.com/ His dedicated website (no longer active) ‘gaelg.iofm.net’ gathered together learning resources which had never been available online before. Phil’s vision and willingness to embrace technology put him and the Manx language ahead of so many others. "an unsung hero of the success story of the Manx language’ and that to receive such an award as the RBV ‘would be a deserving and fitting recognition of the work and dedication that he has put into the development of the Manx language over the last 50 years." A short video interview with Phil Kelly RBV is available here. An audio recording of the speeches at the RBV award ceremony is available here.